My mom celebrated her 98th birthday today (February 17). I am so thankful to God for her and the spiritual impact she has made in my life and in the lives of so many others. I wanted to honor her today by listing a few of the things that I’ve learned from my precious mom over the years. 1. A smile is worth more than a thousand words. She can’t talk now, but her smile communicates volumes. Her smile draws others to her. 2. Friends are precious and valuable. Appreciate them. 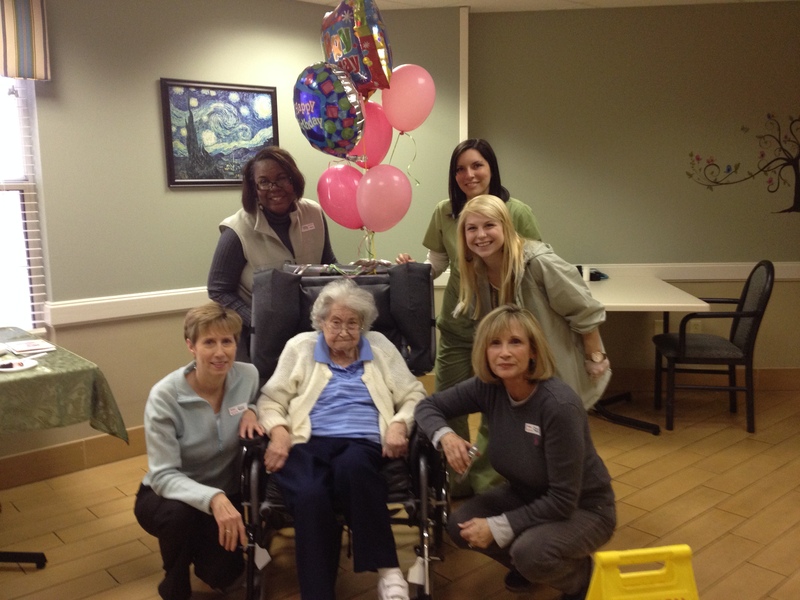 Everyone loves mom at the nursing home and she is surrounded by friends there. She’s had sweet friendships as long as I can remember. 4. Be slow to pick a fight, and be slow to join in when someone else tries to pick a fight with you. I used to get so mad at mom because I couldn’t get her to fight with me. She just wouldn’t go there. 5. Love God and love His Word. Mom taught Sunday school till she was almost 90, and she would study her Bible every day. I have some of her books and have read some of the notes she wrote in them. She loves her Savior. 6. If you don’t have something positive to say about someone, don’t say anything. In the past, mom has had friends who tended to be negative, and it drove her crazy! 7. Cherish family. Mom deeply loves her children, grandchildren, great-grandchildren, sisters, nieces and nephews. She cherishes her family. 8. An independent spirit can be a good thing… or a not-so-good thing. I’ll let you figure that one out. Happy Birthday Aunt Margie… We love you! Jay, Thank you for all the birthday wishes for mom! She loves all of you and misses you. Dianne, I know you understand the emotions this season of life holds. I am grateful for my sweet mom. And I know you miss your mom. Moms are a special blessing. I miss you! Crickett, I miss Mother every day! Miss you too! The day will come when we will get a really good visit in with the two of us! Jennifer, mom has been an inspiration to many. And how many moms and grandmothers like ice cream for breakfast??? Mom does. She rocks!